snips snippets: Finish it up Saturday? (just doesn't have the same ring to it as friday) anywho - the secret project edition! Finish it up Saturday? (just doesn't have the same ring to it as friday) anywho - the secret project edition! Well, this gift has made it to it's final destination and i can safely show some pics of it! I was recently invited to join a Birthday Bash Swap and there was no way i could resist with the lineup of friends that are involved! First birthday girl was Julie from 627handworks. I knew right from the jump that i wanted to make her the Ellie Travel Case from Heidi over at Fabric Mutt. I've been wanting to give it a try since first seeing it. And let me tell ya, it's awesome! Super easy tutorial, though for some reason i thought it was going to be bigger (but it could definitely be easily made bigger or smaller!) That being said, it is in fact the perfect size for a travel case. Julie had mentioned one of her favorite fabric designers was Carolyn Friedlander, so of course i had to use some Botanics. I paired it with some Flea Market Fancy and a bit of Field Study to make some flying geese. I am really loving flying geese at the moment and i think i may need to make a quilt of them to get them out of my system! I wanted the bottom to have a bit more structure so i used some denim that i had on hand. I used the wrong side of the denim, i find it has more interest than the right side. I used it for the handles as well, and while it was harder to sew through so many layers, i think it was worth it. I'm wishing i hadn't of used it for the zipper ends though. I also made a cute little open wide zip pouch to go with it. By now you all know how much i love these little zip pouches! I've lost track of how many i've made now, though i think i'm getting close to about thirty! This one is by far the smallest i've ever made. Here it is with a lip balm and nail polish for size! Cute eh?! So all in all i think i did okay with my first swap, and Julie seems to like everything. So that's a win in my book! Okey dokey, moving right along. Max is all about stacking and building things right now so we're loving blocks here. He can't quite work legos like his brother yet so i wanted something that he could stack on his own. Enter Caravan Shop's Olliblocks! I love these little blocks and i hope my boys get a lot of use out of them! They we're super easy to make, though time consuming. Only because i wanted to make them look a little more vintage. So i sanded them down after applying the pictures. I've used two coats of Mod Podge and will probably throw on some more in the future. I absolutely adore the pictures on the alphabet blocks! So, with the addition of all these to our block collection of course we needed a bag to keep them all in. Is anyone surprised that i made another open wide zip pouch? I briefly considered making a drawstring bag for them but Max loves zippers right now so that was the deciding factor for the zip pouch. This is the biggest one i've made to date and it still has plenty of room for future Olliblocks! Okay, now for something that doesn't require a zipper. For those of you that have been hanging with me for a while, you'll no doubt remember my epic hexie quilt i've been making with AMH voiles. Well... i'm throwing in the towel. This quilt will not be happening. I've thought long and hard on this and it isn't the first time i've wanted to give up on it. I first thought it was only because i just didn't have the time to get to any hand sewing but in reality i don't really like it. I mean it's pretty, but it's not me. At least not anymore. And what's the sense in putting so much time and effort into something for me that isn't actually me? Especially when you're working with such glorious fabrics! So i've been sifting through my Pinterest boards looking for the perfect quilt to make and i think i've settled on a x&+ quilt. I'm loving this mixed scale one by Karen of Capitola Quilter but i'm thinking of using just the Pastry Line prints (right stack) for all the +'s, and the top print on the left for all the backgrounds. I think it has enough colour and pattern to keep it looking scrappy. But the warm stack is clearly bigger, and i just love them all together anyway. So that was a short lived plan. I also am pulling these two prints out of the mix. They just don't fit with the rest. So i'll set them aside, maybe for a figure 8 scarf? For a gift? I don't know. And i also have this print as well that didn't make it into the stack but i think it should be used in the quilt as well. Love this print! Now, i'm not sure when i'll be getting to this quilt, i still want to ponder the idea of it and i still have way too much on my plate to even think of another quilt! Here's a quick shot of my Gypsy Wife progress for those that don't follow me on Instagram! Though it's grown considerably since i took this shot! I've finished putting together a third of the quilt top now and am cutting the strips for the next section! Stay tuned for the quilt top finalé! Next week maybe? I'll try! I also have been thinking about putting up a post of tips and tricks for all those that are gypsy-wifeing. Just some of my trial and error stuff and how i would have done things differently on this quilt. High fives for Saturday Finishes! Oh!! I totally forgot, i also started in on this little project. Ahem. Yep, that's right. I'm making a weekender, and with Melody Miller phones!! Awesome. Okay, that's it... for reals this time! Perhaps i should be high 5ing Saturday Starts? How about high fives for everything! You've been busy, Nicole! No wonder you didn't manage to post your finishes on a Friday - you were too busy sewing! I love all those fun bags you've been making and I can't tell you how many times I've consider that Amy Butler Week-ender pattern. I figure I need to make a few more of her patterns that I already own before launching into it! And good call on the re-work of the quilt for yourself. It's never too late to change your mind on something that you're not quite in love with and is going to take a lot of valuable sewing time! Holy epic sewing batman! I loved hearing about all your projects. I think you're right to let the AMH hexi quilt go if you're not feeling it after due consideration. That is SO much work to not love it. And those fabrics are so glorious. You could always make your already-completed sections into something else. Maybe for the swap! 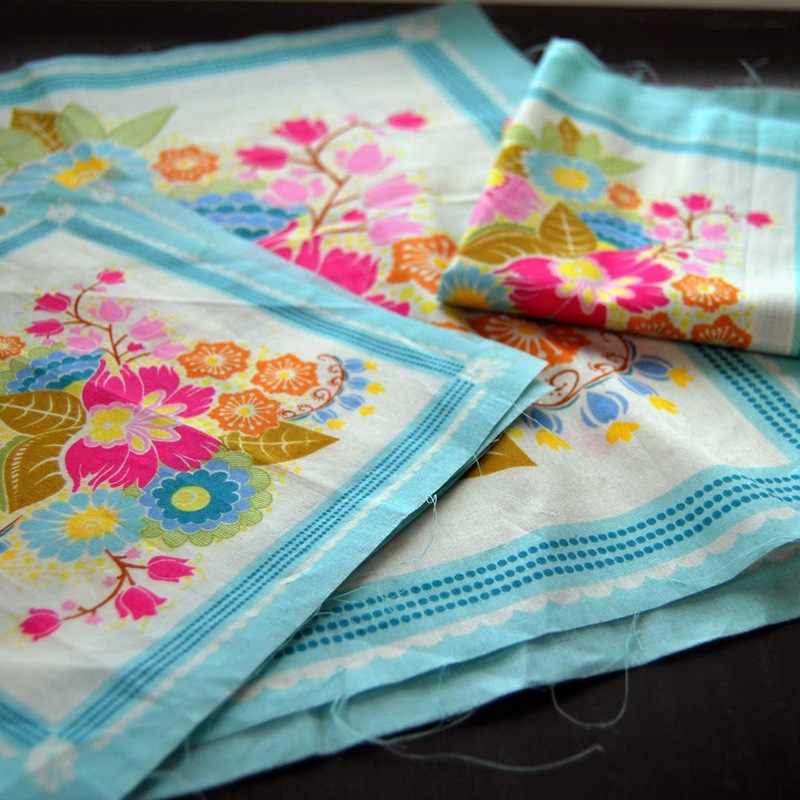 I love those pastry line prints and I DESPERATELY want to see them done in quilting cotton. In every color and shade of the rainbow. Finish it up Friday sounds better, but finish it up Saturday is way more realistic. So... My birthday is coming up ;) Fantastic travel case, I love the quilting! I've decided I need your stash, like seriously you have some gorgeous fabric! Too bad about the hexies, but honestly, I agree, why waste time on something you're not going to love. Also, now I want to sand my Olliblocks, such a great effect (except I won't because I'm lazy and they are done). I actually gave them a spray of clear varnish/shellac/whatever you call it. I found the mod podge goes whitish when wet. I love all your projects and love seeing your finishes!! Or just progress too! Lend me some of your zipper expertise! And on a more somber note- I could not get the video to work, sorry. I'm guessing that Max loved his quilt though, high fives for that! Oh my goodness! What a treasure trove of handmade goodies. Love the travel bag....you've been a sewing machine! Oh Nicole. Once I reach the end of your post I almost forget what was at the beggining :-) But I'm going ooohhh and aaaahh all the way :-) Love the blocks and pouches. Your quilts are bit busy for my eyes but totally crazy YOU! The fabric stacks are gorgeous! dear lord woman I don't know where to start! This is the best post ever. Ellie Travel Case - love the fabric! Bag for blocks - I want one (I have no blocks, but I am sure i could fill it). Abandoning the hexie project - you go girl! I have been cutting things loose lately too. If you don't love it, leave it, X and + - YES! and finally, the weekender, Give me those phones! You are awesome. The End. Defiantly a high five day, I actually like the look of the denim on the zipper ends, adds a nice bit of interest. I have some hexies that I have had an on off love with for years. I go gun ho for a while then ignore them for longer. Just starting the X and t quilt myself! Well done day indeed. Mine, mine, mine, mine, MINE! I have no idea what you're talking about with the lining because I don't notice anything unusual. My presents are awesome! Those blocks are possibly the cutest toy I've ever seen. I can't believe you made them! The open wide bag has perfect fabrics to store it all in. I'm excited to see your weekender! Finishing it was probably my proudest sewing moment. I have just found your blog. It is great.i will be following you on bloglovin. Cannot wait to read more of your adventures.
. Once again great blog. Woah, there's so much in this post, I don't know where to start, but it's all awesome! I love open wide pouches, although I have never made one. I will have to remedy that. And I hadn't thought about using them for toy storage - what an excellent idea. Those hexies look brilliant! I'm not a big hexie fan, but those colours are amazing. I hope you atleast make some cushions out of what you have done already. 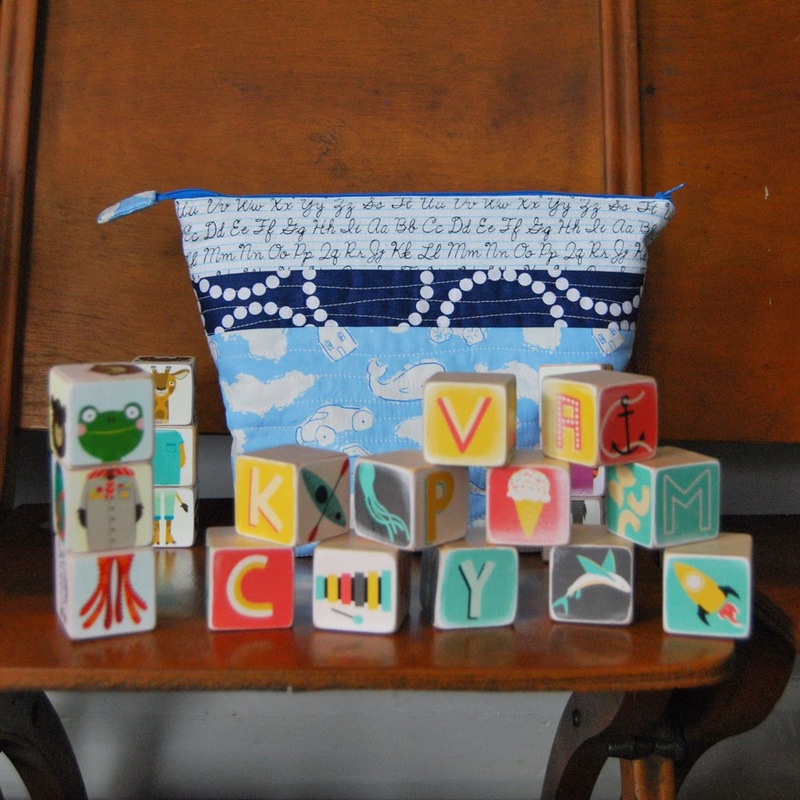 I'm seriously loving everything in this post, from the bags, to the toys, to the beautiful fabric choices.